What Are Heat Exchanger And How Do They Work ? 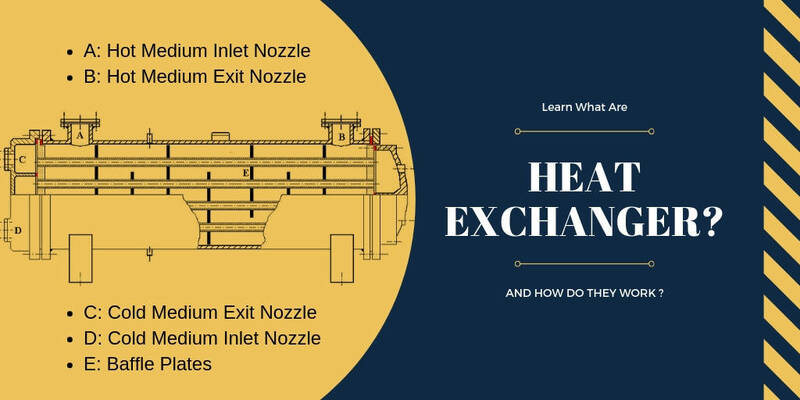 ShipFever > Marine > Ship > What Are Heat Exchanger And How Do They Work ? A heat exchanger is a device which allows for fast and efficient transfer of heat from one medium to another. It is used to heat or cool a particular medium using another in the vicinity. 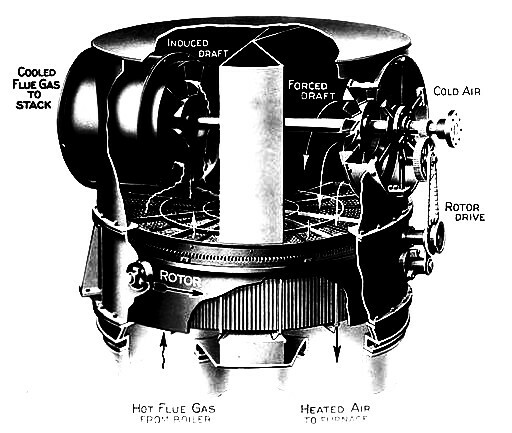 The process works based upon the basic science of flow of heat; from hot to cool medium. While anybody can decrease or increase the temperature of a medium; using physical contact or intermixing with another medium. A heat exchanger allows for the transfer of heat without actual contact in between. It basically consists of segregated elements with high thermal conductivity to act as an element for heat transfer. They keep the two fluids separated from each other; while allowing efficient transfer of heat. Irrespective of the and shape of the exchanger; the actual heat transfer happen in response to the relative flow of liquid in these segregated elements. A heat exchanger can have concurrent, counter or cross flow arrangement; for effective heat exchange between the medium. In an counter flow arrangement the two medium flows in opposite direction to one another in separate tubes or segments. Due to their opposite but parallel flow direction it is also termed as parallel flow type. While the method is well known for its high efficiency; it is used where we need to bring a large change in temperature in record time. A concurrent flow on another hand have counter flow with one medium flowing left to right; while the other moving top to bottom. Due to its flow direction its is also termed as counter flow type. Similarly when a heat exchanger have arrangement where; the two medium exchange heat crossing each other at 90 degree. The flow method is called to be cross flow type with an efficiency; in between that of the other two methods. A heat exchanger can come in many size, shape and types. While one can classify it into various sub types including; shell and tube, plate, direct contact type, heat generated, stem injection type, wet surface type with rotary and reciprocating regenerative heat exchanger. But only three main types are mostly used across various industries; shell and tube, plate type and regenerative heat exchanger. Being compatible with all kinds of fluids including gas; a shell and tube heat exchanger is the most used device across industries. It consists of two major parts; a large spherical shell casing with a number of tubes running inside. A typical shell and tube exchanger can have tubes running from one side to another; or bend inside to follow a U-shaped path. The most simple design in the construction of shell and tube exchanger; is the one with tubes welded to the shell. It is most economical and allows the movement of fluid from one side to another side of the shell. Moreover it allows for the manual cleaning of the tubes internal along with normal chemical cleaning procedures. The two fluids flow in tubes and the surrounding shell; with heat flowing from medium in tubes to that in shell or vice versa. The inlet and outlet points for shell medium is called; inlet and outlet nozzles for the shell. On another hand the inlet and outlet points for tubes are called front and rear header respectively. The tubes used in its construction must be thermal conductive with the ability to withstand thermal stress; due to varying temperature across the width of the tube surface. Moreover the tube must withstand the thermal expansion with change in temperature. Furthermore the tube must be strong, corrosion resistant and compatible with fluid medium. The material of these tubes should be such that it does not react with these fluids under normal condition. A heat exchanger works on the simple principle of second law of thermodynamics; the heat flow from a body to another in respect of their temperature difference. The heat under natural state will move from a hot body to a cooler one. In shell and tube type heat exchanger the cooling medium; whether water, steam, ethanol or polypropylene glycol is passed through the tubes within the shell structure. On other hand the medium to be cooled around these tubes within shell structure. In most scenario the cooling medium say sea water enters from the bottom or rear header based on design; to leave from top or front header passing through aluminum brass tubes. Similarly the cooling medium say lub oil enters through the inlet nozzle to leave via exit passing through baffles within shell structure. These baffles helps improve the efficiency by creating turbulence in the flow avoiding creation of hot and cold pockets within the medium. It also can have either concurrent, counter concurrent or cross flow arrangement based on design and requirement. The temperature of the output fluid medium is controlled using a bypass valve; increasing or decreasing flow of the cooling medium. Similarly to protect the fluid medium from intermixing due to leakage; the pressure of cooling medium is kept lower than that of the fluid medium to be cooled. This allows the fluid such as lub oil from being contaminated even in event of any leakage. A plate type heat exchanger transfer heat from one medium to another with the help of identical thin plates; made of titanium or stainless steel. They are held together with the help a fine clearance maintained by the gasket material of rubber and asbestos fiber. They are much compact and have an added advantage of variable capacity. Because of its simple design and large surface area; it is easy to clean and operate with higher efficiency then shell and tube heat exchanger. It basically consists of six main parts namely; pressure plate, frame plate, caring bar, guide bar, plates pack and support post. When combined together they form a plate type heat exchanger; that consists of plates pack made of corrugated metal plates with holes for passage of fluid medium. The plates pack are held in place by the pair of plates; the one which is fixed is called frame plate while one which can move is called pressure plate. Even the number of plates in a plates pack is not fixed but is determined by the factors such as; flow rate, pressure difference, operating temperature, types of fluid and installation cost. A single metal plate can have high or low tetra pattern which aids in efficient heat exchange between the liquids. These corrugated structure types creates turbulence in the flow; creating much better heat exchange between the two medium. The complete plate pack assembly is as such; that the hot medium flows on one side of a plate while cold flows on another. For better heat exchange between the medium via metal plate; the fluids flow in a counter concurrent direction. A plate type heat exchanger works on the simple principle of thermal conductivity and second law of thermodynamics. It basically consists of pack of plates with four ports for inlet and outlet of warm and cold medium. These warm and cold mediums flows through alternative channels; with different medium on opposite sides of the plate. The gasket along the corrugated plate structure protects the medium from intermixing or flowing to the wrong plate side. The two fluid medium in the system follows a counter flow path with; one fluid getting in from top while leaving at bottom and another entering at bottom and leaving at top. The rate of flow is controlled in the system to avoid negative effects of turbulence flow such as erosion. The type and length of plate is selected as per the requirements as; the rate of heat exchange and its efficiency depends upon the size and thickness of the metal plate. With a series of plates stuffed together with a very fine clearance; a thin layer of fluid forms on the either side of the metal plate. This provide with a large surface area for heat exchange. A plate can have different corrugated structure on the plates based on the flow rate efficiency required and temperature difference between the fluids. With proper operation one can achieve proper heat transfer with plate heat exchanger with temperature difference as low as one degree. A regenerative type heat exchanger can be of rotary or fixed matrix type; where the heat is transferred indirectly from one medium to another via a heat storage medium. This allows for the same medium to be used both as an hot and cold medium. This kind of heat exchanger is used only when; either the two medium are a heterogeneous mixture or have lots of dissolved impurities. The most common types of such heat exchanger are used in ballast furnace. It is a much simpler design with higher surface area to transfer heat from one medium to another. The whole assembly is easy to construct; cheap and require much less maintenance. The only problem with such design is that its hard to calculate; the exact heat transferred or its actual efficiency. This alone makes it unpopular among modern industries which work at fine margins. It’s more like a technology of the past used today for its cheap cost, ease of use and capacity to handle large fluid volume at once. It’s a quick return on investment with no problem; to deal with difficulty maintaining performance in very cold conditions. The system in most case is used to heat air with an flow rate of 400 to 85,000 m3 per hour. The complete assembly is consist of a rotor, its shaft, galvanized steel frames and bearings supporting the shaft. A regenerative heat exchanger can have its heat storage medium made of material such as ceramic material, aluminum or steel. In cheap designs with less efficiency; material such as bricks, honey comb and spherical particles are also used. In many modern industries the system is widely used as a waste heat recovery tool to increase the overall efficiency of the plant. Unlike plate or shell and tube type heat exchanger it has an indirect mode of heat transfer. A hot medium fluid is first send to a temporary storage area called head storage area. They are generally an place full of packing and heat absorbent material. Here the hot medium loose part of its heat and pass it to the walls or surroundings. Now; the medium is flushed out and filled with another cold medium. The time period for which the hot medium is supplied and stored is called hot period. Similarly, for the time being cold fluid is flushed and stored is called as cold period. In this cold period the heat absorbed during the hot period is released and transferred to the cold medium. The continues process of hot period followed by a cold period gradually increase the temperature of the medium. When after countless cycles of such action an additional steps or process reversal is used to maintain efficiency. Other than normal heat exchanger where we see cross or counter concurrent flow; a regenerative type can also have concurrent flow type. A regenerative heat exchanger have better effectiveness, reduced exchange volume, better pressure drop and ease to modify as per requirement at low cost. This makes it more economical and easy to operate than a plate or shell and tube type heat exchanger. With these property with ease to choose any flow type makes it suitable option for air to air heat exchange.